The Get Up Kids’ anticipated new Kicker EP — their first release in seven years and debut on Dine Alone & Polyvinyl Record Co. — is out today worldwide. The EP was named one of June’s “most anticipated” releases by The AV Club and Pitchfork, and the band recently spoke with The FADER, SPIN, and Consequence of Sound about their long-awaited return. The band — Matt Pryor (guitars/vocals), Jim Suptic (guitars/vocals), Rob Pope (bass), Ryan Pope (drums), and James Dewees (keys) — begin a headlining U.S. tour on June 14th in Dallas, TX. A full itinerary is listed below. Since the release of 2011’s There Are Rules LP, the band have been touring when their schedules permit and living very adult lives that include activities like raising kids (Matt, Rob, Jim), moving away (James) and moving back (Ryan), starting businesses (Ryan), getting a degree in geology (Jim), joining a local kickball league (Matt), accidentally being electrocuted on stage (Rob), or simply struggling with social media. Correspondingly while the band’s early releases were written while the band members were entering their twenties, Kicker sees them in their forties, and the songs show a perspective that can only be learned from experience. 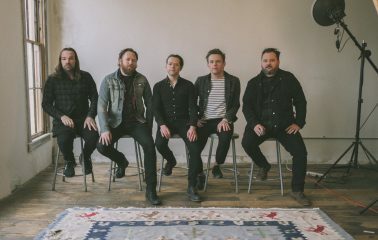 The Get Up Kids have never been afraid to try something new, but the songs here — recorded over the course of the last year at Fire and Ice studio in Baldwin, Kansas — mark a full-circle breakthrough for the band. 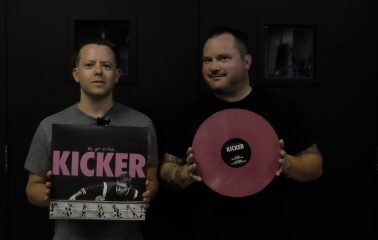 It’s a release that sees the band learning from the past while reaching toward the future lies at the core of Kicker, retaining their signature sound while simultaneously proving they aren’t afraid to redefine who they are in the current moment. The name of the EP is a reference to their foosball obsession — which dates back to their first European tour and is still played in their current practice space — but also serves to sum up the overarching concept of these four songs. “You always look back in rose colored glasses, and I always remember when this band was really struggling and we were selling our CD collections to pay our rent and that sucked at the time, but looking back that was an amazing time, that was so much fun. There was no pressure or anything,” explains Suptic. Kicker retains that carefree idealism — capturing the fresh urgency of their most revered releases — while proving that their journey is still unfolding. The Get Up Kids may have grown up but they haven’t become jaded. Kicker is out now on Dine Alone. It is available for purchase here.